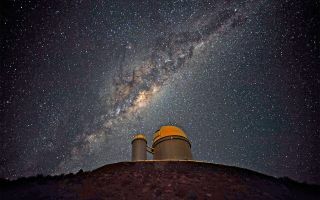 The Milky Way stretches across the sky above the La Silla telescope in Chile. Trillions of planets lurk in our galaxy, many of which have not yet been found. Thousands of fascinating new worlds have been discovered beyond our own solar system, ranging from supersize gas giant planets to small rocky bodies — and the search continues to better understand these distant worlds. NASA's Transiting Exoplanet Survey Satellite (TESS), launching today (April 16) from Cape Canaveral Air Force Station in Florida, will help pinpoint exoplanets comparatively close to Earth. An exoplanet is a planet located outside our solar system that generally orbits a star, much like Earth orbits the sun. Most exoplanets discovered to date have been detected using what is known as the transit method, which looks for dips in a star's brightness that suggest a planet is passing across the face of the star. Another technique, called radial velocity, looks for repeated "wobbles" in a star's movements that suggest a planet's gravitational pull is yanking it back and forth. While most exoplanets found so far are hundreds or thousands of light-years away, and we don't yet have the technology to travel to them, astronomers are still able to study their temperature, atmosphere, composition and other details from afar, in the hope of finding possible signs of life, according to a statement from NASA. In 2016, a roughly Earth-size alien planet was discovered around our nearest neighboring star, Proxima Centauri, which lies just 4.2 light-years from our own solar system. That planet, known as Proxima b, circles in the "habitable zone" of its parent star, suggesting it has the potential to host liquid water, and possibly life, on its surface. However, the search for exoplanets began long before the discovery of Proxima b. In 1988, a team of Canadian researchers proposed the existence of an exoplanet now known as Tadmor. At the time, their data wasn't strong enough to publish, and, as a result, their discovery was withdrawn in 1992. It wasn't until 10 years later that the existence of Tadmor was confirmed in 2002, according to the statement from NASA. Instead, the first exoplanet to make its debut to the world was 51 Pegasi b — a "hot Jupiter" gas giant found in 1995. This strange alien world is 50 light-years away and orbits close to its sun-like parent star. While 51 Pegasi b was the first alien world ever discovered around a sun-like star, scientists detected three "pulsar planets" even earlier. These planets were found in 1992 around a superdense, rotating stellar corpse, called a pulsar, located some 2,300 light-years away. Today, equipped with advanced technology, the rate of finding new and exciting exoplanets continues to increase. And there are many left to find: Our Milky Way galaxy alone "probably contains about 400 billion stars, our sun among them. And if each of those stars has not just one planet, but, like ours, a whole system of them, then the number of planets in the galaxy is truly astronomical: We're already heading into the trillions," according to the statement from NASA. Future missions such as TESS will expand our search for exoplanets, looking for planets orbiting some of the closest and brightest stars in Earth's sky. TESS will monitor at least 200,000 stars for signs of exoplanets, ranging from Earth-size rocky worlds to huge gas giant planets. Data collected during this mission will be used to identify targets requiring further study by the James Webb Space Telescope, which is scheduled to launch in 2020.